When it comes to snacking on a ketogenic, low-carb diet, energy is of the essence. You want fuel with just a few bites. Of course, the main focus here is fat. Oh, and naturally, we want a lack of carbs. You can throw some protein into the mix if it makes sense. Otherwise, there are few limits in our way. See, someone on a regular diet might reach for a piece of fruit, a pastry, or a candy for a snack, but there’s a huge problem with this: that’s just not fuel. Your body’s going to burn right through that glucose, and it’s going to be smart enough to want more because you need consistent energy intake for consistent energy output. The keto diet addresses that problem by fueling with fat instead. It keeps the fire ablaze for a lot longer with a lot less tending to. These are some tasty, high-fat, low-carb snack options for you on the go, when you’ve got the munchies, or you just need a boost. Fat bombs, anyone? (Yes, please). First, let’s run through the basics. Good quality protein powder. Many keto cookies and sweets use protein powder to bulk up the protein content, of course, add flavour, and bake with. Avocado. You’re going to find avocado in a LOT of keto snack options, whether or not it’s obvious. Always have a few handy. Unsweetened dark chocolate. If your snacks tend to be chosen by your sweet tooth, you want that 100% cocoa – the real deal! Coconut oil. Y’know… because coconut oil fixes everything. You probably have some. If not, it’s time to stock up. Swerve sweetener. This is the chosen, healthy, aspartame-free, natural sweetener for curbing the keto sweet tooth. Get it, use it, love it. Cheese. On its own or by itself, good quality cheese is a lifesaver when it comes to snacking and keto snack recipes. Keep a variety. Similarly, these roll-ups are easy to make with no-cook ingredients. This one uses just three simple ingredients – cream cheese, salami, and pickles – to make a satisfying bite-size snack with plenty of savoury, healthy fats and some crunch from the tasty pickle in the centre. Meatballs might not be thought of as standard snacking fare, but eating healthier is all about changing your mindset a little. They’re the perfect snack because you can make them in big batches, freeze some for easy thawing later, customise them to your taste, and eat them with your fingers. Consider these guys the best of the best because every bite is full of cheesy delight. Jerky is generally loaded with sugar. Seriously – you’d be surprised if you checked the labels on those store-bought brands! This is made with budget-friendly beef mince instead of steak, and it skips out on the sweet marinade. Nothing like some hidden veggies in your finger food! These juicy, spicy, turkey meatballs are good for popping, dipping, meal prep, and freezing. We’re reinventing the snack wheel, and meat is on the menu. Three ingredients make for some bite-sized meaty miracles with these satisfying snacks! Ground beef is mixed with pepperoni for a flavourful, fatty, energising morsel. You could make these ahead of time, toss ’em in the fridge, and simply grab one when you’re feeling peckish – minimal effort required. This no-cook finger food is best served on a stick. You could easily assemble one or two of these for a fancy afternoon bite. Food just tastes better when you don’t even need a plate (or a stove). Hit up the antipasto bar, grab some fresh prosciutto and mozzarella, and add your favorite crunchy veggies to the mix if you like. Cracklings are the stuff dreams are made of. Otherwise known as pork rinds, this is such a staple in low-carb snacking. They’re perfect for scooping up guacamole with or taking on a road trip. If you don’t have time to make ’em, we recommend EPIC pork rinds. Boiled eggs are a nice keto snack option. Deviled eggs take it up a notch. Guacamole deviled eggs? Say no more! Actually, we forgot to mention the bacon. Whatever way you decide to take your devils, this is an easy munchie to make ahead of time and grab out of the fridge. This might be a heavier snack, but sometimes, you just get hungry. This mixes up two of our favorite fats – one for the dip and one for the dipping. Bacon chips are the new tortilla chips. Haven’t you heard? If you thought you didn’t like liver, you do now. This recipe will change your mind – promise. Liver is one of the most nutrient-dense foods, and the keto diet is all about packing in those healthy eats! It’s loaded with vitamins and minerals, including hard-to-get vitamin D. This is rich, creamy, decadent snacking. Spread some on seed crackers, keto buns, cheese slices, or cucumbers. We’ve got news for you: you can make crisps out of avocado. This recipe blends two keto favourites – cheese and avocado – for a crunchy, satisfying chip you’ll love munching on and will keep you satisfied for hours to come. When the potato chip cravings hit, these are the answer. Cheese bakes up beautifully into something crunchy, salty, and savoury for plain consumption, dipping, or whatever your heart desires. There are minimal ingredients in these, and you can easily experiment with different types of cheeses for different flavour profiles. Cauliflower isn’t meant to be simply steamed and eaten. Oh, no. You’re wasting potential that way! This dish brings out the best. Cauliflower takes quite the turn when roasted in the oven with crispy edges. This recipe is almost like eating popcorn chicken. This is a great low-carb snack to boost fibre and up your veggie intake while keeping it keto. It’s also good for dipping. Most fat bombs are slightly sweet concoctions with chocolate, nut butter, coconut, berries, and the like. These ones? They take on savoury notes with delicious gruyere cheese, spicy jalapeno, cream cheese, and the quintessential fat – bacon! If you need a little something to dip those chips in, this is the jam. It’s just eight ingredients, and it’s nice to have handy for munchies or entertaining. It also makes a nice potluck dish to bring to a party. We all know that the low-carb’ers need something to munch on during gatherings, too! Considering your keto diet will not include anything legume-like, hummus is mostly off the table. That is, until you’ve re-imagined it! This dip is made from pureed almonds with tahini, lemon, and olive oil which give it that classic hummus, Mediterranean-inspired flavour. Dip some veggies or some cheese slices in this for a quick bite in between meals. These candied nuts are all the crunchy, slightly sweet, munchie deliciousness of their pre-packaged counterparts without the sugar. Cocoa and cinnamon are the golden combo, bringing out the best in almonds. Pack these up for a hike or for a post-gym snack. Sometimes, plain and simple nuts just won’t cut it. Keep it spicy and savoury with this curry-dusted pecan recipe. Warning: this will be highly addictive! Try pre-portioning snack-size baggies of these for the road or the office. These also make a gorgeous addition to a salad for adding taste and texture. Of all the snacks in the land, a slice of leftover cold pizza MIGHT just be the cream of the crop. Instead of carb-loading for a slice of the good stuff, make these zucchini bites! They’ve got all the toppings you love without all the carbs you don’t love. Okay, maybe YOU love carbs, but they don’t love you back. Either way, this recipe is a good idea. Cloud bread is like a hot piece of buttered toast. It’s comforting, fluffy, flavourful, and delicious. It takes just a few ingredients. You can pack sandwiches or top it with eggs for lunch, or you can have a slice when you need a little something mid-afternoon, spread with some cream cheese, dip, or pate. Tater tots are a no-go on the keto diet, but cauliflower tots are totally acceptable. These are packed with veggies, sharp cheddar, and heavy cream for the ultimate satisfaction. These are another good option for dipping and for the kiddos. Dipping into the cereal box is a classic snack move when you need something a little sweet but not too sweet. We all know cereal for breakfast leaves us hangry too soon, though. This granola is loaded with healthy fats and no added sugar keeping it keto-friendly and just as snackable. Protein, healthy fats, creamy nut butter, rich chocolate… this is what energy is made of. Your body will thank you for this bar that feels more like a brownie. There aren’t a ton of options for healthy, nourishing protein bars on the go that are low-carb and delicious. This recipe will change your mind! We have granola. We have a protein bar. What about the granola bar? This is your low-carb answer with just 4-6 net carbs per serving. You might have to work to fit ’em in, but this is great if you need some energy. You can tweak fruit (or no fruit) to your liking and carb needs. Otherwise, this is healthy fats galore with that nutty, slightly sweet, and chewy bite you love. Remember those pudding cups from when you were a kid? Yeah, this is reminiscent of those. Mousse is a bit fluffier, just as fudgy, and nearly as nostalgic. This recipe is made all without the sugar without compromising taste. Reese’s cups, anyone? Fortunately for us all, both peanut butter and chocolate have potential to be low-carb. The marriage of the two is the pinnacle of treating yourself. One of these is the perfect fat bomb for sustained energy and candy cravings alike. True story: everyone loves fudge. It’s quite easy to make keto-friendly with cream cheese and almond butter. One of these will set you back just one net carb for the day while satisfying that chocolate craving for miles with a deep, rich, dark cocoa taste. This is low-carb heaven at its finest. Berries are pretty much the one “safe” fruit on keto – in moderation. These bliss balls are packed with blueberry flavour (and antioxidants!) with plenty of fat to boost your mood and energy when you need it the most. These are also kid-friendly and ideal for lunchbox packing. Sometimes, you need a little fat AND protein. This bark is like eating a healthy chocolate bar, except it’s infused with protein powder and nut butter for a simple-to-make treat. This is nice for a boost after the gym to keep your muscles fueled, or passing on to the kiddos who need a bit more protein for their growing bodies. Slices are a delicious treat, especially when they look like this. These bars are infused with fresh cherry flavour, a chocolate brownie base, and a layer of creamy goodness sandwiched in between. Can you even believe they’re low-carb? Us either! 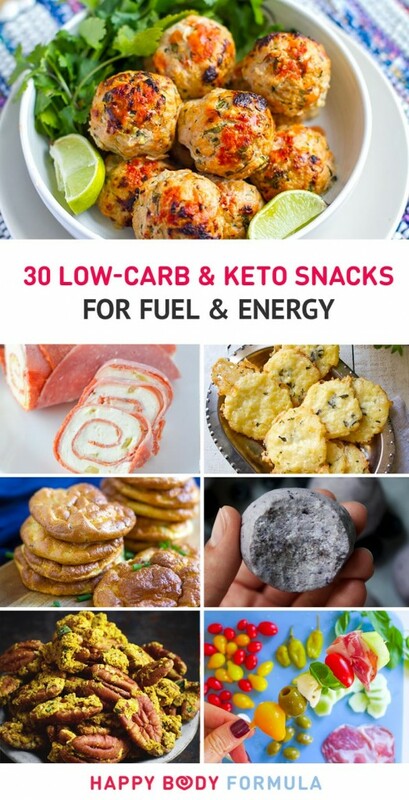 We hope you enjoy these keto snacks! If you did, consider sharing with your low-carb friends. If your sweet tooth is strong, check out some of our favourite low-carb cookies. Enjoy! Share this blog post on Pinterest from here. Content looks awesome! thanks for posting the recipe! Totally appreciate it!